Six days after I posted my recipe for cream cheese pastry, Lorraine of Not Quite Nigella fame, posted her recipe for strawberry hand pies. The pastry recipe is so similar and as I had not thought about using ‘my’ version for sweet dishes I decided to give this a try. We live in apple country and there is a large variety of apples for us to choose from. I don’t usually stick to one variety for baking, but for eating I am very fussy. I like tart, crunchy apples and so my preference for raw eating is always Granny Smith, or Pink Lady. What is your apple preference? Your hand pies look delicious – I love baking pies, but have never made them mini. I’ll have to give it a try! Too bad I can’t get Cox’s Orange Pippin in the States, but Granny Smith is my go-to apple, particularly for baking. 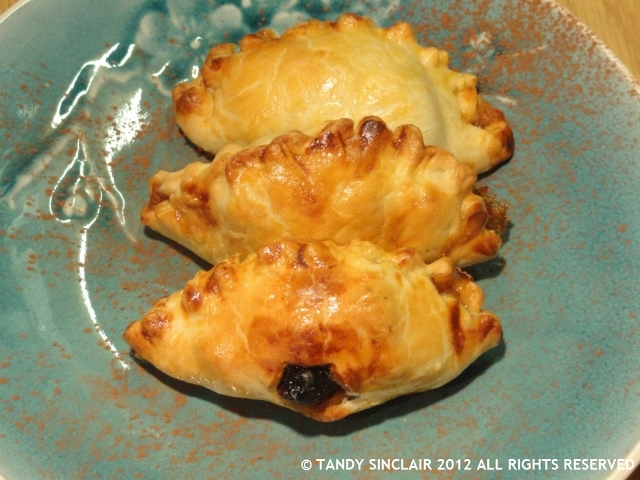 Thanks, Tandy, for sharing these beautiful little hand pies for Monthly Mingle. The round-up will be online today. I live in Apple country as well Tandy and I’m definitely making these little pies. Delish! As a young child I remember picking a Golden Delicious from the tree – and I can still recall the taste which lived up to the name. Sadly it was never, ever repeated with that variety which is tasteless in the shops. A Cox’s orange pippin is probably my favourite. Apple pie. One of my all-time favourites, Tandy. Thank you! Tandy – lovely apple pie – if only I could use pastry properly! Have a great week. Such a fun – and tasty – twist on the classic apple pie! Lorraine’s recipes also work really well & I love your tasty filling too! do you think it counts if you eat more than one of these? Lovely looking apple pies Tandy. Its looks really nice Tandy! I love this—what a great spin on a classic—and both your apple preferences are fantastic! and how pretty are pink lady’s?! These are adorable! I’ll have to take a look and see if I have time to make these! I love Pink Lady apples too. Your hand pies look fantastic! which is all I can cope with right now as WordPress is taking forever to do anything!